Now that I’ve had some time to reflect on my first Half Ironman, I have answered some of my questions about long course racing as well as learned some lessons about what I need to work on going forward. The race was everything I could have hoped for and I achieved my main two goals which were to 1) have fun and 2) learn something about long course racing that I can use in my full Ironman. 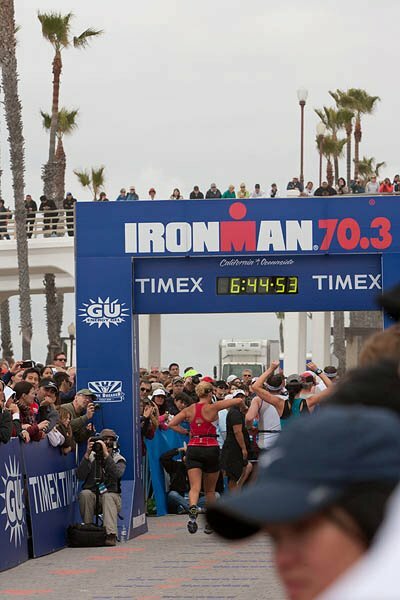 In my pre-race strategy post, I gave myself some more specific goals for Oceanside. Let’s see how my race stacked up! 1. Confirmation that my self-created training plan is working – or confirmation that it needs to be tweaked. I really think that my self coaching is working! Although I don’t have anything to compare it to, I had a great first race and I think that I was very well prepared and also well rested for this race. Nutrition went well on this race. I actually consumed MORE calories than I planned yet it all went down just fine and I had absolutely no stomach issues. I did, however, really not feel like taking my 4th Gu on the run course, so I’m not sure how I will feel about taking more fuel on the run at the full Ironman. However, my fueling strategy on the bike will be slightly different at the full IM and my race intensity will be less so hopefully I can handle it. 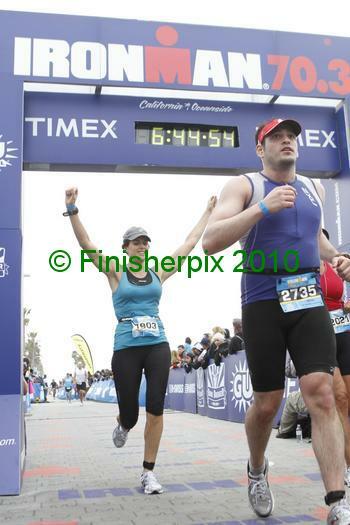 Well the cold water part went ok except for the fact that my calves cramped toward the end of the race. As for the open water swimming part, I learned I’m not very good at it! Prior to this race, I did some open water swims in the ocean with no buoys. I felt like I was veering back and forth while I swam but since there were no buoys there was no way to really tell or practice. I need to get to some open water swim practices that have buoys ASAP! My sighting was absolutely miserable and I kept veering off track. Unfortunately at Oceanside the buoys are to the left and I breath to my right and also the race course is not straight, so it’s even more difficult. In my previous two races as well as various practice races and aquathons I’ve done, I didn’t have much problem with swimming too far off course because the course was straight. Luckily at CdA the course will be straight so that will definitely help! It was recommended to me to get in a few 2.4 mile open water swims before the race. I think this will help a lot. 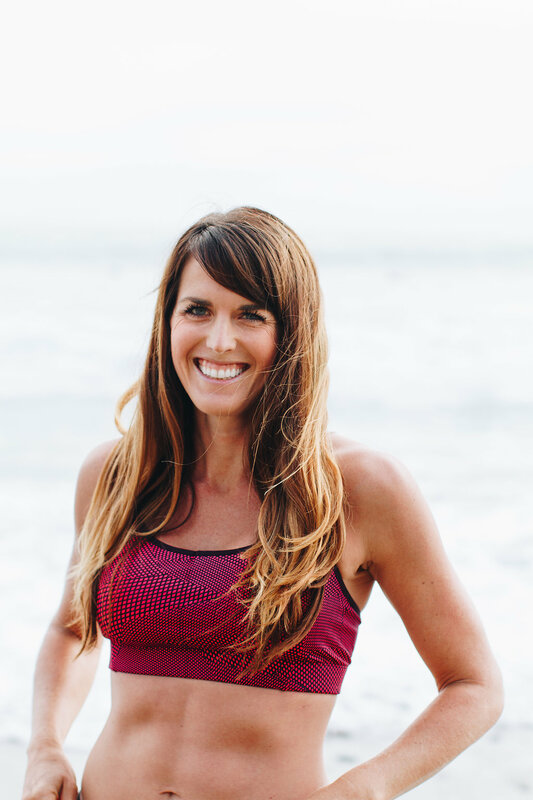 I’m also going to try to attend a few of the Thursday night open water interval workouts in Mission Bay put on by the same coach who did my swim stroke analysis. Not only do I hope to practice open water swimming, I’m hoping Jim will give me some feedback on whether or not my stroke has improved since our original meeting. Well my primary weaknesses at the race were definitely my open water swimming, my transitions, and my in ability to fix things on my bike. I already covered open water swimming above, so I won’t go into that anymore. My transitions were both on the slow side (although everyone has a long T1 at this race due to a pretty long run from the swim to T1) mostly because I wanted to be as comfortable as possible. I think I’m ok with my slow transition time if it means that i will have a more comfortable experience during the race (ie putting on clean, dry pants for the run, spraying sunscreen, putting on my top in T1 so that I’m not riding in a wet tri top). However, during T1 I was a bit frazzled and did things in a funny order (i.e. one arm warmer than put on my helmet, then top, etc) AND I made the mistake of trying something new on race day – I put hand warmers (the ones that get warm when you take them out of the package and you use when you go skiing or camping) in my cycling shoes to keep them warm and then apparently didn’t take one of them out in T1. I rode the ENTIRE 56 miles with a hand warmer in my shoe without knowing it due to the fact that my feet and toes were frozen from the cold water!!! I didn’t even figure it out until I got my cycling shoes on the following week for an easy spin and found it in there! No wonder I had a blister the size of Atlantis on my foot! As for the bike, I rode the whole bike course with my brake rubbing against my wheel, slowing me down. I know how to fix a tire, but I don’t know how to fix anything else on my bike! Little did I know that I could have just gotten off my bike and moved the brake a bit to fix the problem. I also learned the valuable lesson that it’s crucial to have someone else look at your bike prior to an event. If you can’t afford a tune up, at least check it out yourself! 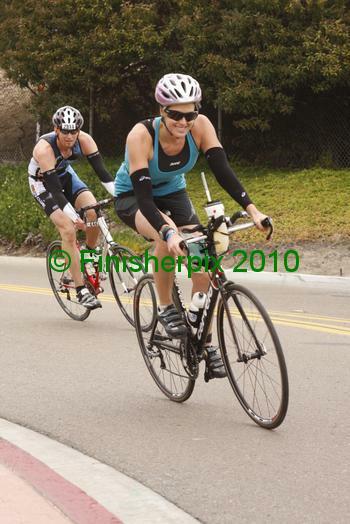 Besides that, my bike time overall and within my age group was my weakest of the three sports. This was expected since it is the newest sport to me and it just reconfirmed my need to prioritize time on the bike. I know this is my largest area of weakness but I like to think of it as the area I can most improve in. I felt REALLY good coming off the bike. My legs didn’t feel heavy at all. After all my weekend rides I run a short brick, usually 3-5 miles. My legs always start off heavy but I always finish the run with a lower than usual average pace. I was very pleased with my half marathon time coming off the bike – it was actually my 2nd fastest half marathon time ever! I haven’t run an open half marathon since last August so I’m not sure how my Half Ironman half would compare to my current open half marathon however. I read before the race that if you pace and fuel yourself correctly on the bike, you should be able to maintain your marathon pace on the run for a half Ironman. I ran a full marathon in February at a 8:46 min/mile pace and I ran this race at a 8:44 min/mile. Part of me wonders if I paced myself a little too well on the bike and I held back a little too much. As I mentioned in my race report, I was holding back in anticipation of the hills and the headwind in the last 10 miles. The hills were easier than I thought and the headwind was present but very manageable. I picked up the effort for the last 10 miles but I think I definitely had a lot left in the tank. Since my next race is a full Ironman, I don’t think I should increase the intensity at all for that race, but I don’t think I should decrease it much. 2) Tell your friends and family what you will be wearing and try to wear something bright or distinct. My Dad repeatedly told me this (although they did see me several times) and my cousin drove an hour to get there, looked for parking for an hour, waited around for over two hours and then didn’t see me at all until I was coming down the finish chute! 3) Do the expo early. Don’t wait until 4 p.m. the afternoon before the race. 4) Don’t put hand warmers in your cycling shoes to warm them up. Not only do they not warm your shoes up, you could ride 56 miles with one in your shoe. 5) SMILE for the camera! I was glad I did. Overall this was a great race! I exceeded my expectations in many ways, mostly on the bike and on the run. I was disappointed with my swim time, but I learned a valuable lesson in the process (and if there is any leg to be disappointed in, it might as well be the shortest one). I had so much fun racing and I definitely can’t wait to see how I improve at this distance the next time I race it. But that’s for a different year – for now, it’s time to focus on covering 140.6 miles on June 24 at Coeur D’Alene (did you know it’s only 74 days away!?). Have you ever learned a lesson at a race the hard way? What did you learn? If you could give someone 1 piece of advice for racing an Ironman what would you tell them? There are so many things I want to comment on here, but I’ll keep it brief! First, I can’t believe you had a hand warmer in your shoe?!?!?!?!?!?!! Question for you: where did you learn the most about race day nutrition? I’d need to keep learning! Also, do you use your aero bottle first and then go for the cage (stupid Q, but I’m learning). And finally, and good resources for learning to change a tire? I could go on all day, but overall, this race is just going to make you that much stronger for CdA. I’m so excited to watch you dominate and I can’t believe it’s so close! Good luck in the final stretch! I learned a lot about race nutrition from the section in The Triathlete’s Training bible and also by reading other people’s blogs and online articles and asking people for advice (ie everyone I meet that says they have done Ironman). Pretty much the main piece of advice I got from every person who has done IM is to practice your nutrition and to write it down so you know what works best for you. I’ve been training with the concentrated water bottle of CarboPro and the Stinger Waffles for a couple months now and it works for me. I actually drank both my water bottles throughout. The aero bottle was just water and the other water bottle was full of a concentrated calories/electrolytes that is to be drank over the course of the entire race. At the full IM I will have a 2nd bottle in my Special Needs. I got this tip from a blog I read – the only risk is that if you drop your water bottle you are out of calories! I refilled my front aero bottle twice during the half IM even though it wasn’t empty yet. Mike taught me to change a tire…so I can’t help you there! But I bet you can find videos on YouTube! Best bet is to have someone who knows how to do it help you! Ask any more questions you want! Thank you! You definitely should do one! It’s such a fun challenge! It sounds like a fabulous race. I can’t believe you had a hand warmer in your bike shoe! Although not qualified to do so, my one piece of advice is not to think you’re not doing enough. It’s easy to compare your workouts to other bloggers, friends, etc. and worry about the quantity you are doing. Believe in your training and don’t worry about anyone else! sounds like you got a LOT of great information from this race!